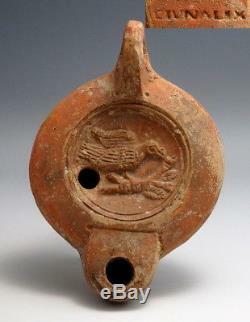 Information: A Roman oil lamp depicting an eagle on a sprig to central discus. Maker's mark to base which reads: "CIVNALIX". Condition: Minor chips to base otherwise good clear detail and intact. Please note:- Any questions regarding this object/s will be answered ASAP during office hours 09.00-17.00 GMT Monday to Friday, excluding national holidays/bank holidays. Items offered by denant (Den of Antiquity Int Ltd) are unconditionally guaranteed to be authentic. Certificate of Authenticity Invoice upon request. Antiquities Dealers Association and British Numismatics Trade Association member and as such abide by their code of conduct. The BNTA has become an effective force in the fight against forgery, theft and other criminal activities, thus establishing a benchmark for the highest ethical standards in the domestic coin trade. Members receive early warning notices of counterfeit coins and stolen property. The Association is a Corporate Member of the Museums Association, is represented on the executive of the British Art Market Federation and has close links with the Council for British Archaeology. Cheque: payable to: Den of Antiquity Int Ltd & send to: Den of Antiquity Int Ltd PO BOX 1114 CAMBRIDGE CB25 9WJGB/UK. The item "ROMAN TERRACOTTA OIL LAMP OF AN EAGLE & MAKER'S MARK (L440)" is in sale since Monday, October 30, 2017. This item is in the category "Antiques\Antiquities\Roman". The seller is "denant" and is located in Cambridge. This item can be shipped worldwide.